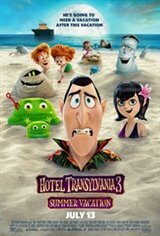 Hotel Transylvania owner Count Dracula (Adam Sandler) realizes he is lonely and decides it might be time for him to try and find love again after spending the last hundred years working non-stop. He attempts online dating but has no luck finding someone special. His daughter Mavis (Selena Gomez) recognizes how tired and lonely her father is and takes it upon herself to give him both a vacation and a chance at finding love. The group indulges in all the amenities and activities the luxurious ship has to offer. Dracula finds himself attracted to the ship’s beautiful cruise director, Erika (Kathryn Hahn), who reciprocates his feelings. However, as it turns out, she is the great-granddaughter of vampire-hunter Van Helsing, which leads Mavis to question Erika's intentions.